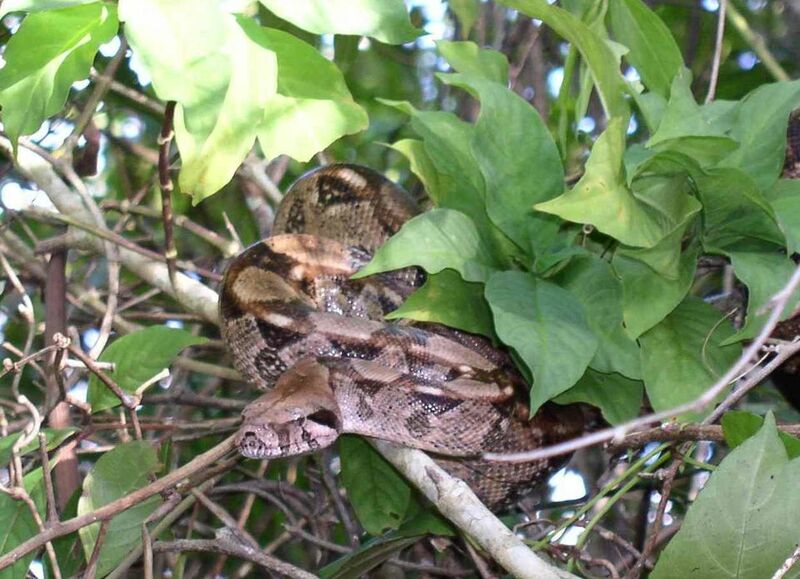 Central American boas encompass boa constrictors from Belize, Costa Rica, Panama and other Central American countries. They have a wide range of colors and morphs, which are variations different from those commonly found in the wild. These morphs include motley, bloody hypo, super hypo, ghost, sunglow, and albino, among many others and give the Central American boa a wide range of beautiful color patterns. Along with Columbian boas, Central American boas are often referred to by pet stores as "common boas." They should not be confused with red tail boas, who hail from Columbia, grow larger than Central American boas and have a distinctive red tail.Ranging from 4 to 6 feet in length, Central American boas are smaller than their cousins in South America. They make great pets and are easier to handle and maintain compared to other large snakes like the reticulated python. While it is hard to call any large snake a great "starter" snake, boas are popular with first-time snake owners because they are generally well-behaved. The Central American Boa is slightly more aggressive than the Columbian boa, but quickly becomes docile with the right care and handling. You should plan to hold your snake several times a week, especially in the first months, to help grow the bond of trust between snake and keeper. Remember to wash hands both before and after handling your boa. Not only will this reduce the confusion that your hand is food, it helps prevent the spread of mites and parasites, and ultimately, is healthier for both snake and human. Despite their eventual size, a young boa can become intimidated in a larger cage. While small, boas should be housed in a 10 to 15 gallon vivarium or a cage 1 foot wide and 2 feet in length. As the boa grows, they should be transferred to their permanent housing, which should be at least 2 feet wide and 4 feet long. Most Central American boas will max out at around 6 feet, but if your boa does exceed this, a larger enclosure may be needed. As with any snake, a place to get away from it all is a requirement. A box is great for providing a hiding place to a younger boa, but something a bit sturdier may be needed as the boa puts on muscle. Ideally, you will want two hiding spots, one on the warmer side of the housing and one for the cooler side. A young boa requires more frequent feedings than the larger adults, so plan on feeding the Central American boa once a week until it gets to around 2 to 3 feet in length. You can slow feeding to once every 10 days until the boa is fully grown, at which point it is best to limit feeding to every two weeks. It is important not to overfeed your boa as this can lead to health issues in the future. Boas love a diet of mice and rats, but you should take care when feeding live animals to your snake. We may think of our boas as great predators, but a live animal can harm a snake, so remain observant while the boa feeds. The food should be about the diameter of the boas body and should not be any bigger than the widest portion of the snake. Most boas can be transitioned to eating dead or frozen food with some training. Always warm frozen food before feeding using warm water. Never microwave or heat food in an oven, which may cook the inside of the food. A sturdy water bowl large enough for the boa to soak within should also be included in the housing. The water should be changed out daily and will help keep the humidity up within the enclosure. The bottom of the boa's vivarium or tank should be lined with appropriate substrate for bedding. Newspaper, paper towels, aspen or cypress mulch, or snake carpet are all acceptable. Avoid pine or cedar mulch, which is toxic to reptiles. The enclosure itself can be decorated with sticks, rocks and small plants. Boas should have varying temperatures within their housing. This should include a hot basking area between 90 and 95 degrees F and a cooler area between 78 and 82 degrees F. Heat sources can include heat pads, ceramic heaters, hot rocks, undertank heaters, and basking bulbs. Hiding spots for both the hot and cool sections are recommended, and ideally, they should be identical. Dermatitis: If you spot blisters on your boa, you may have a problem with the temperature or humidity. Check to make sure the enclosure is hot enough and not overly damp. You should clean the cage and provide a smaller water bowl if it is oversized. Parasites: Snake mites and other parasites can transmit diseases to the snake. Clean the housing regularly and remember to wash hands before and after handling. Respiratory Diseases: A common ailment among reptiles that can cause further problems, pneumonia, and other respiratory diseases are often caused by varying temperature that becomes too low for a long period or too much humidity in their environment. Inclusion Body Disease: IBD is a deadly virus that can affect boas. If your boa has trouble righting itself when turned over or shows weakness when trying to constrict, a trip to the vet is in order. There are a wide range of beautiful colors and morphs when choosing your boa, but first and foremost is picking out a healthy snake. The boa should be alert with frequent tongue flickering. There should be no visible cuts, bruises or blisters on the snake. Examine the head of the snake to ensure there are no sores or bubbles coming from the nose. Check the eyes and tail to ensure no excess from shedding is left, which could be a sign of parasites or other health issues. Choose based on temperament as well as appearance! A young boa that is calm when held in your hands will become an older boa that remains calm while being held.